Extra-thick double chocolate chip cookies with a soft, cake-y center. Last Thursday we were hit with a pretty fierce snow storm–twelve hours of non-stop snowfall. I used to love the snow as a kid. Now, it’s just one big headache. As a kid, snow was mystical and fun. My brother and I would turn our pjs inside out before going to bed whenever we heard they were calling for snow, a ritual guaranteed to get us out of going to school the next day. It was the equivalent of doing a rain dance in the summer. When our ritual would pay off, we would spend the snow day tubing down the hill behind the high school across the street from our house, building igloos and snow forts, or just rolling around until our snowsuits got soggy and our feet were frozen. We would play outside for hours (do kids still play in the snow?). When we went home get warm, my mom would throw all of our gear into the dryer and we would would do it all over again until nightfall. As an adult, snow days are wasted shoveling, salting, and trying our damnedest not to flip off the guy next to you chattering away on his phone while you sit in traffic. Last Wednesday evening, I watched car after car pull into the grocery store parking lot across the street. Our adult snow ritual is to panic about the snow and rush off to the grocery store for milk, bread, and toilet paper. I find this ritual absolutely absurd. How long do you think we’re going to be stuck in the house? If you live in the northern region of the country, I get it. For most folks, the snow is cleared and you’re good to go the next day. I do have a new ritual. When I hear they’re calling for snow, I make sure my bar is stocked. Let’s be honest, the snow is less daunting and more enjoyable when cocktails are involved. If you’re one of those people who shovel as the snow falls, you’ll find that a few nips of whiskey will warm you up and better prepare you for the undesirable task. I’ve tested the theory; although, I prefer to wait until the snow stops to shovel. Last Thursday I found myself booze-less. I’ll admit, I was an irresponsible snow preparer. I forgot to stop at the liquor store. To make up for the lack of bourbon, I resorted to cookies. 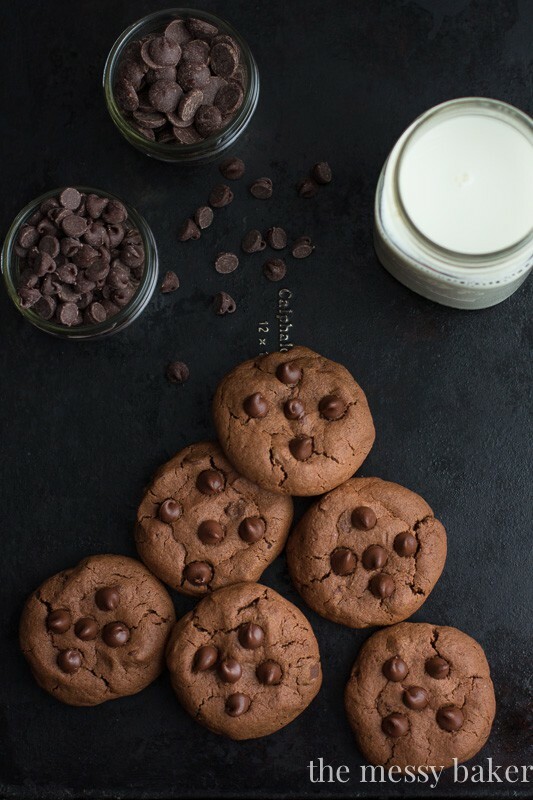 These double chocolate chip cookies are just that–double the chocolate. Extra chocolate = extra delicious. I scaled this recipe down to make just enough cookies for two people, because a batch of 24 cookies is a major tease and an often failed attempt at maintaing self control. The great thing about these cookies is that you don’t have to refrigerate the dough before baking them. When you find yourself with a fierce craving of cookies, this is the recipe to make. The cookies are soft and gooey on the inside–they almost remind me of a really moist chocolate cake. Preheat the oven to 350 degrees F. Line a baking sheet with parchment or a silicone mat. In the bowl of a stand mixer fitted with the paddle attachment, cream butter, brown sugar, and granulated sugar until light and fluffy, about 1 minute. Add the melted chocolate and mix to combine. Add the egg and vanilla extract. Mix until combined. Scrape down the sides of the bowl with a rubber spatula and give the mixture one more quick mix. In a small bowl, whisk together cocoa powder, flour, baking soda, espresso powder, and salt. With the mixer on low, slowly add the dry ingredients. Continue to mix until thoroughly combined. Fold in the chocolate chips. Measure out 2-tablespoons of dough at a time and roll into balls (the dough will be a little sticky). Place the dough balls on the cookie sheet, spacing them 3 inches apart. Gently press down each dough ball slightly. Bake for 15 minutes. Allow the cookies to cool on the baking sheet for 5 minutes. Transfer to a wire rack to cool completely. Store the cookies in an airtight container for up to 3 days. Hi, these look scrumptious. Could I double or even triple the recipe? With 3 teenagers in the house 7 cookies would disappear, faster than Santa on Christmas Eve. Talking about stocking up, people in the UK have a tendancy to clear the shops of bread and milk at the mere mention of snow in the weather forecast. A bit like Christmas grocery shopping, shelves are cleared in anticipation of ‘making sure everyone has their christmas favourites’ and ‘the shops are closed for ONE WHOLE DAY – what if we run out’!!!!! Thank you so much for stopping by. Yes, you’re definitely going to need more than 7 cookies. I haven’t doubled or tripled this recipe, but I don’t see why you couldn’t. The recipe ingredients are fairly even, so it should double or triple quite easily. Let me know how you like the recipe. Happy baking! Growing up in the south we didn’t get very much snow and when we did (which was never more than a couple of inches), I would always want to try and build a sad snowman. Haha. So now, living in Maryland, I still find the idea of snow novel. I like to take midnight strolls in the snow. Something so peaceful about fresh snow. I don’t know. I’m a weirdo. However, those cookies look delish. 7 cookies is definitely the right amount in my house, for sure. Snow is a beautiful thing. It’s just a pain to clean up. Thanks for stopping by. Enjoy the snow! Ha ha ha. The bar definitely MUST be stocked up before a snow storm hits. And we need chocolate to. So you are totally my hero right now. LOVE these cookies! I have definitely learned my lesson, Liz. Never again will I neglect stopping at the booze store. Thanks! Yep I could eat this small batch all by myself! These look perfectly chewy and delicious! I have made 4 batches so far. Squirrel is obsessed. Thanks! Jennie, double chocolate chip cookies sound perfect on snow day…even when you missed your booze. I thought I love snow, but being a california girl all this time has spoiled me big time. We were in Chicago a week ago and it was snowing very light and made us missed home already. Stay warm, buddy! I’m so jealous of your all-sun-all-the-time weather. Thanks so much, Linda! Never again will I miss my before-snow booze stop. Thanks, Shannon! Maybe “for two” normal people, but “for one me” ;) They look delicious!! Thanks, Medha! I’m currently obsessed with those PB stuffed cookies. They’re wicked good! I have a nice collection of wine going on in my basement for snow days. Usually, I shovel and sleep on snow days. I’m ready for the big thaw to happen so that I sip on margaritas and watch the grass grow green. In the meantime, I think I’ll make some of these cookies! I need your bar-stocking skills. I’m all about staying under the covers and baking on snow days. Thanks! Heck yes to starting a boozy snowstorm tradition! Bummer you were out of the alcohols for the last go-round, but I’m sure baking these cookies softened the blow. Whaddya say we fashion ourselves up some caramel cinnamon martinis and dip these cookies in them?! These cookies definitely helped me forget about the booze. I’m loving your boozy dunk idea. It’s on! Haha. Jennie I love your blog. It’s not one that I skim. I’m with the first commenter though–7 cookies?? I will be tripling this one. When it snows I need to BINGE girl. Probably because I don’t have the booze option though. lol. love your pajama ritual with your brother, that’s so cute. You are so sweet, Karen! I’m all about packing it in during a snow storm. Considering I’ve already made four batches of these, I think I’ll triple the recipe next time. Thanks, girl! haha down here people panic like mad when snow is coming (I grew up in the north so I don’t have the same reaction) … right before the last “storm” we got, I drove by the liquor store. It was PACKED … we are talking like a line of waiting cars to get into the parking lot! That has nothing to do with cookies but apparently they all thought the same thing as you :) Snow is much more fun with cocktails! Jennie! You know how I love chocolate and cookies! And these are totally beautiful!